SUMMARY: Developed and executed cross-platform content strategy to build a beloved brand at startup ecommerce fine art site 20x200.com. 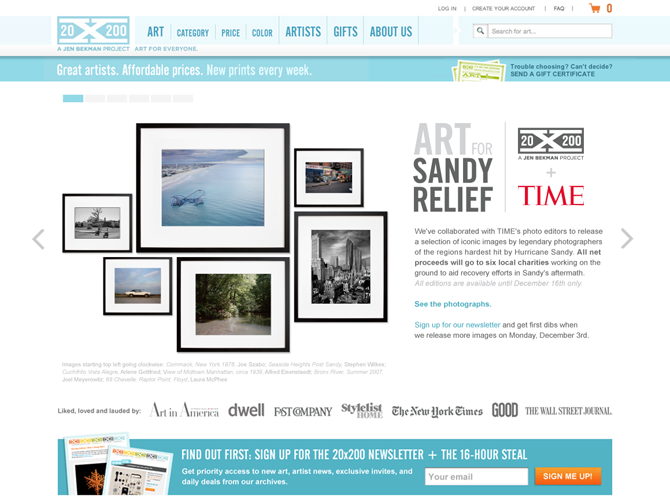 Scaled editorial and curatorial processes for 3X output to catalyze 7X revenue growth. Maintained above industry average open rates and CTRs for email marketing campaigns throughout growth. Executed high-profile co-branded collaborations, including two fast-selling art collections for West Elm. Closed single largest sale (+$210K). Most proud of newsletters written to introduce new art and artists (a few of dozens, possibly hundreds, archived here).